Warner Middle School, located in Westminster, CA, is the home of 1,100 Wildcats – students in the sixth, seventh, and eighth grades. The large campus includes classrooms, administrative offices, a lunch area, a gymnasium, and large athletic fields. In addition to offering a standardized curriculum, Warner Middle School provides students an opportunity to personalize their middle school experience by offering a robust assortment of electives, clubs, and sports. The staff of over 40, including teachers, administrative and facilities staff, is led by Principal Amy Kwon. Warner Middle School’s mission is simple: Prepare all students to be responsible, resilient, resourceful, and productive world citizens in a changing and diverse society. That said, achieving this goal can seem anything but simple when you have a “mere” 1,100 children on an expansive campus! 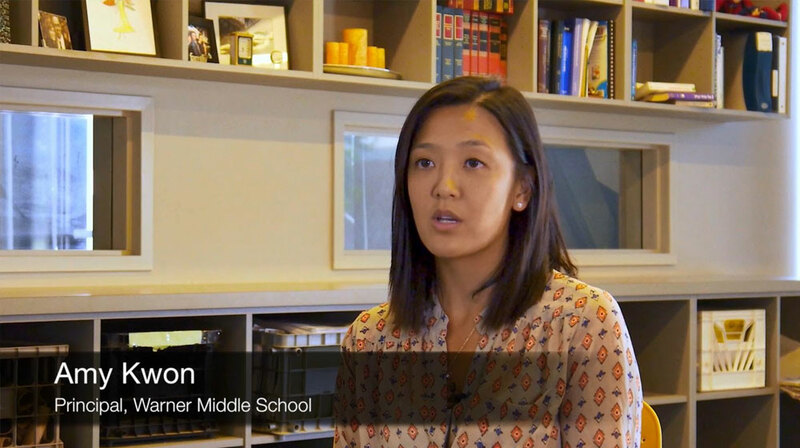 Given that the staff has to contend with any number of variables and challenges each day – from facilities issues to students in particular need of guidance – Ms. Kwon did not want to repeatedly add “staff communications device failure” to the list. Unfortunately, that is exactly what was happening. “We often have situations where we have to communicate with each other quickly; you might call them emergency situations. Our previous (walkie talkie) system didn’t always work, so we’d have to run around and try to find the person we were looking for,” explained Assistant Principal, Dan Sage. Another issue to contend with? The need for confidentiality and privacy. It is of the utmost importance for the staff to keep student-related information private, and to be careful not to broadcast messages that could spread panic or worry if overheard by other students in the event of an emergency. Warner Middle School also needed reliable, rugged devices with the ability to communicate over long ranges, a walkie capable of covering every location on campus efficiently and confidentially. Luckily, the DuraWalkie was up to the challenge. Jason Lopez, Electronics Skilled Maintenance Worker for the Westminster School District deployed the EnGenius DuraWalkies on a peer-to-peer and walkie-to-walkie basis. The staff saw immediate and welcome results starting with installation. Another benefit? Clarity of communications and highly secure wireless communications that are a hallmark of EnGenius phones. “At the beginning of the school year we had our old walkie system, and oftentimes we would pick up signals from other agencies. Since we switched over to the DuraWalkies we haven’t overheard anyone else’s conversations,” said Principal Kwon. Not only does this prevent interference between on-campus communications, but it also ensures that conversations and information remain private – that they are not unintentionally shared with an outside audience. DuraWalkie reduced the stress of failed communications while increasing school safety. Team members can communicate with office staff and relay critical information from anywhere on campus, and the DuraWalkie’s independent 2-way intercom feature has improved both efficiency and confidentiality. The Warner Middle School staff was so pleased with the DuraWalkie deployment results that they plan to upgrade to the DuraFon PRO. This will allow them to communicate via the PA system, receive calls from the outside and transfer them directly to the handsets. Making calls directly from the DuraFon PRO handsets will also facilitate a quicker response from medical and law enforcement personnel, should an emergency arise. Click HERE to learn more about DuraFon Long-Range Cordless Phone Systems!